1. Dr. Pedro Ara was the man who embalmed María Eva Duarte de Perón after she died July 26, 1952. There were persistent rumours that Dr. Ara also made a precise replica of Evita’s head in wax that was virtually indistinguishable from the real thing. Dr. Ara was known to carry to parties hatboxes containing perfectly preserved heads of not so notables. Dr. Ara advised the Russians on possible methods to preserve Lenin’s cadaver. 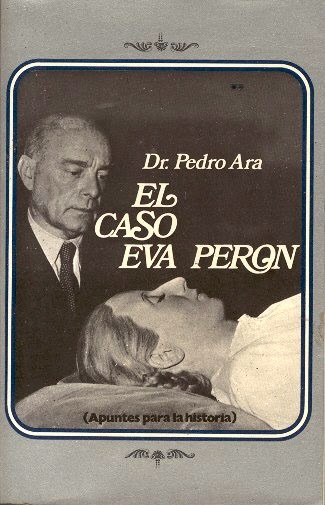 Dr. Ara wrote a book El Caso de Eva Perón in which he reveals a few of his methods in 1974. The book is out of print but still available. 2. 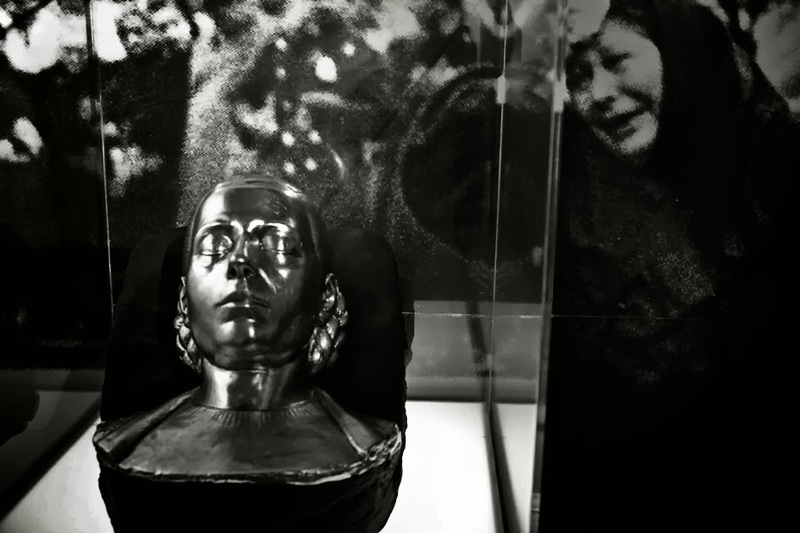 When Evita’s body was removed from its original holding space at the CGT (the very Peronist headquarters of the Secretariat of Labour where Evita had held court as the spiritual head of the nation) in 1955, flowers would mysteriously appear outside of whatever place her body was hidden by the military authorities who deposed Juan Domingo Perón in that year. The authorities did not want Evita;s body to serve as a rally for opposing forces to the military government. 3. Evita’s body was abruptly removed out of the CGT by Colonel Carlos Moori Koenig, Chief of Argentine Military Security. She was, carried around to many locations including a flower shop backroom. Moori was disobeying the order of his superior, the then president of Argentina, General Pedro Aramburu, by virtue of being the head of the military junta that had deposed Perón, to dig the body into a clandestine burial spot. Moori eventually took Evita to the house of his second in command, Mayor Eduardo Arandía. Arandía had a strange and overly protective relationship with the body of Evita which he kept in his attic hidden by papers. Sometimes he would show her off to dinner guests. One evening convinced that the Peronist resistance was outside his door to retrieve the body he unaccountably shot his pregnant wife to death. He eventually went mad. 4. Aramburu transferred the care of Evita’s body to Moori’s replacement Hector Cabanillas. With the help of the Catholic Church and an ambitious general, General Alejandro Lanusse, who admired Aramburu, the body disappeared. We know from later revelations that the body was buried in Italy under a nun’s name, María Maggi. We also know that when Evita died there was a movement that wanted her to be declared a saint. That most serious Pope, Pius XII declined to initiate proceedings. 5. In 1970 Montonero guerrillas kidnapped Aramburu and tortured him (until he died). If Aramburu knew where Evita’s body was he never revealed it. At that time grafitti appeared on Buenos Aires wall demanding the whereabouts of her body. 6. In 1974, Aramburu's body was stolen by Montoneros. The corpse was to be held until President Isabel Perón (Perón’s third wife) brought back Evita Perón's body. 7. In 1987 unknown persons broke into Juan Perón’s burial place and removed his hands with an electric saw. The hands were never recovered. 8. When Evita’s body was removed from Italy and taken to Perón’s headquarters in exile in Madrid, his wife Isabelita would comb Evita’s hair every day. Her body was put on a platform so that Perón’s dinner guests could gaze on her. 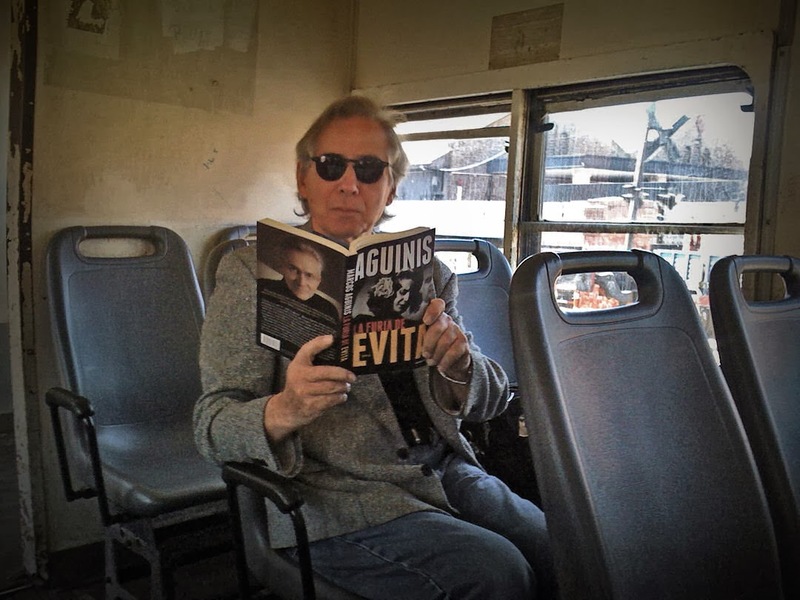 “The novel is the most effective way of telling the truth especially about a person like Eva Perón, whose character has taken on mythical qualities in Argentina,” said Mr. Martínez, who is one of Argentina’s most prominent authors. While some names, places and events have been altered, the novel is a reconstruction of the truth, he said. 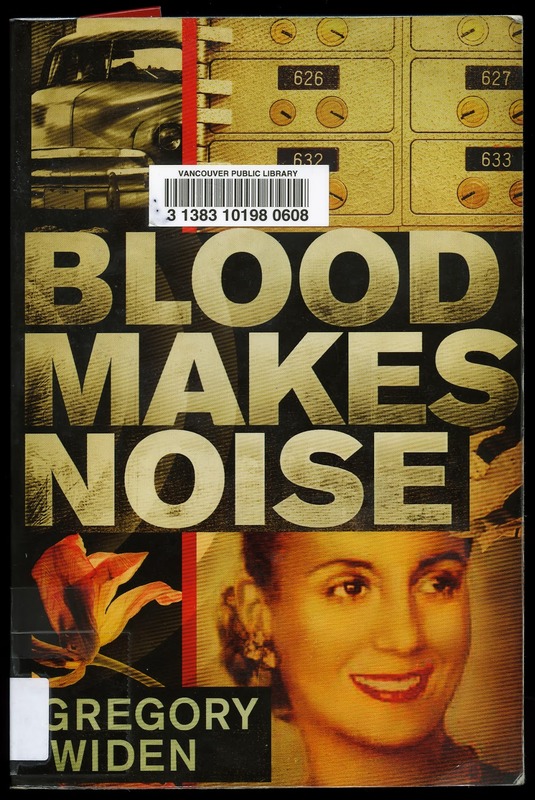 A few weeks ago I spotted Gregory Widen’s novel, Blood Makes Noise in the new novels section of the Main Branch of the Vancouver Public Library. The novel is by a man, a native from Laguna Beach, California who is a former firefighter, NPR Station host, mountain rescue-team member and who also wrote the script for the Sean Connery film Highlander. In comparison to a dead general’s hand being cut off, it does not seem so strange that an American would write such a terrific novel about Evita. If anything I can assert here that Eloy Martínez is right. From this Laguna Beach author I have learned many things about my former country. Likewise, my politically polarized countrymen cannot see their reality because they are in it. This nation has an unreal fixation with the remains of their famous. School children here were taught to dutifully recite the last words of national heroes, like San Martín, and celebrated not their birthdays but the day of their deaths. General Manuel de Rosas, a nineteenth-century strongman who died in England, had been buried for more than one hundred years, yet the government was today using all its wheat power to blackmail a hungry Europe into shipping his mouldy bones home. The dead have power everywhere, but nowhere, it seemed, did their bodies themselves speak more forcefully than in Argentina. Blood Makes Noise is a novel that follows the events of what happens to Evita’s remains in 1952 until she is brought back to Buenos Aires by Isabelita (now the Argentine president as her husband Perón had died of a heart attack). The novel further reveals the conflict between Hoover's FBI and the newish CIA for control of Latin America. The accepted version that Evita’s body now rests in the Recoleta Cemetery, not far from Aramburu, is a current one. Widen’s version may not be the accepted one but for me it was the fitting end to a satisfying novel that no Argentine would ever write. It is a pity that the chances are awfully slim that the novel would be translated into Spanish. When I finished Blood Makes Noise, I re-read V.S. Naipaul’s The Return of Eva Perón which is an account of several visits by Naipaul to Argentina culminating with his last one in 1977. Naipaul’s description of Argentina in that year is not much different to the Argentina that I encountered this September and October. It is a sad fact that these Naipaul essays on Argentina have not been translated into Spanish. Wherever I went I was reminded of Evita. She was on peso bills, there is a Museo Evita and countless books have been written (mostly non-fiction) of her period and her husband’s in Argentina. When I purchased and read the just out La Furia de Evita, a novel in first-person autobiography form by distinguished wrier Marcos Aguinis, my one very Peronist friend Nora Patrich told me that I could not believe anything I would read in the novel, after all it was a novel. I kept quiet, feeling very much like that swimmer talking to fish.